Last week's rescue of 'los 33' after being trapped in a Chilean mine for over two months provides an excuse for papers to review previous stories of survival. In the Observer, Ed Douglas selects The 10 best Mountain Survival stories. 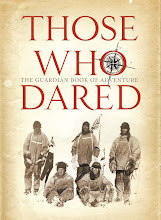 It's a good mix of the well known, such as Touching the Void, Into Thin Air etc, plus a few lesser known tales such as British climber Tony Streather's 1957 expedition to Haramosh. A collection of Guardian and Observer journalism covering tales of endurance and derring-do, from the past 200 years.